When I first started here as the facility supervisor, the electrical situation was a little scary to say the least. One of the first things that I had to do was institute color coding of the wires. I also gave them all plum bobs by tying a 1/2" nut on the end of a string, but that is a different story. 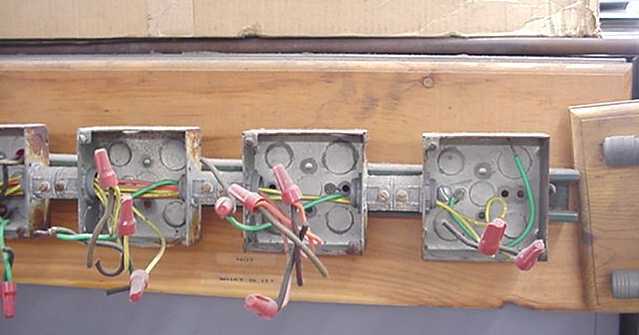 The worst example of color coding was a 3 phase breaker that had three white wires running from it (The wiring was replaced years ago!). This example was saved by the new maintenance crew to show examples of the past crews work. These boxes were on the ceiling and cord was run down to three pumps. I want to make it clear that this was installed before I started here but I can remember how proud the guy was to point out to me that he had used BOY for 480 volts. It is kind of hard to see in the picture, and it kind of got messed up when we pulled it out, but he had run all three brown wires to one pump, all three orange wires to another pump and all three yellow wires to the last pump. I have to tell you I really like this site. It is good to see people that really take pride in their work. We now have a guy here who used to work for a contractor who also takes pride in his work. It really helps out someone like me. Ask him to do a job and he does it right and it looks good. I don't have to check that his drops are straight or that he is using the right color of wire. BOY oh, BOY oh, BOY oh, BOY, now I Have to retrain all, the guys in the shop, sure does help to pay attention in class! I always try to come up with a quick phrase to help out, too bad everyone doesn't read the same newspaper? Can you identify the situation where the NEC requires you to attach a RED wire to an Orange one? You do also need to be careful to check your local building codes. I was on a project several years ago where we were installing 277/480 wiring for warehouse lighting and power distribution, and were using BOY color coding. After about half the wiring for the lighting was completed, the local building inspector came out to sign off on another section of the project, and informed us that we were not supposed to be using orange for the middle phase. When we asked him why, he said that in their local building codes orange was only to be used for the high leg of 120/240 3phase wiring, and that the correct color for the middle phase was purple. He let us change the phase tape on all our big wires and phase tape the yellow wire already installed purple, but we had to complete the project with purple wire. Where did you find the Brn-Vio-Yel coding called out? It occasionally gets spec'd for the orange conflict. I'm curious now, so I'll take a guess: Could it be for linking a 3-wire delta-connected 240V load (normally black/red/blue, yes?) to a 4-wire unbalanced delta where orange would be the high-leg? Or does the requirement for the high phase to be orange extend even to circuits where there is no neutral present? NEC calls for ORANGE to be used to mark the "high" leg of a 208V delta system. (One reason you don't see this much is because you only have two 120V. legs available). NEC also calls out color codes for heating cables; I believe that the color for 208V cable is RED. My point is that this world is just too complex for something as simple as a "color code" to work! Out of curiosity, what are the specified colors for heating cables of other voltages? As someone once said: "The nice thing about standards is that there are so many to choose from." Actually, I don't think there was any requirement to use orange for a high leg branch circuit conductor prior to the '02 code. I believe that in the '99 code orange markings were only required for feeders and services.